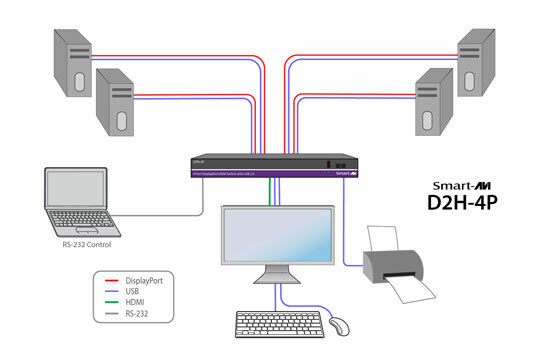 SmartAVI D2H-4P is a dedicated multi-platform KVM switch capable of managing four 4K computers through a single, central workstation. 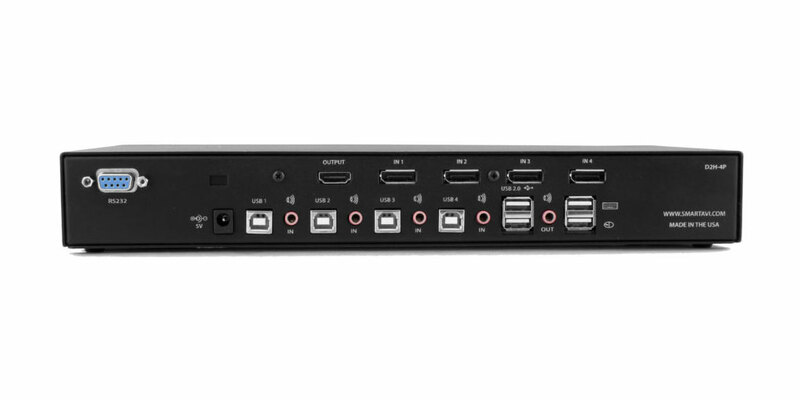 Built with ultra-HD ready HDMI outputs, the D2H-4P is the first Displayport switch on the market to offer full video emulation directly from the device. Up until now, DisplayPort switches lost emulated picture when disconnected from monitors, leading to confusion and disorganization upon reconnecting. With D2H-4P, full EDID-assisted HDMI video emulation ensures visual workspaces and screen resolutions are remembered every time: simple! The D2H-4P is DisplayPort 1.2 and HDMI compliant, supporting screen resolutions up to 4K Ultra-HD (3840x2160 @ 30Hz) for remarkable and responsive video emulation. Additionally, the D2H-4P is USB peripheral-friendly, compatible with printers, keyboards, and mice. The D2H-4P is also easy to control with both a simple front-panel interface, as well as RS-232 functionality. The D2H-4P offers simplified management between four DisplayPort equipped computers' USB 2.0 outputs. Keyboards, mice, and other connected USB devices can be swtiched between with ease. This dynamic KVM console can be controlled via hot keys or RS-232 commands, as well as directly through the console's easy-to-read front panel. The D2H-4P features EDID Pass-Through technology and source recognition, which enables smooth and efficient switching in virtually any scenario. This plug-and-play EDID functionality makes set up hassle free and simple. The USB keyboard and mouse emulation utilized by D2H-4P provides quick source switching via keyboard hot keys. D2H-4P simulates the presence of a keyboard and mouse for every attached computer through a USB cable. This essential function simulates keyboard, video, and mouse control for all connected computers, so switching between each is kept seamless and completely uniterrupted. The D2H-4P has a broad range of applications, but the main function is to centralize the access of up to four computers that support DisplayPort displays in a single workstation. Not only does it function as a KVM console, but it also supports USB 2.0 functionality. This allows users to access nearly USB device, including those not supported by other KVM switches. The D2H- 4P is the ideal solution for medical, industrial, studio and defense applications, where it is not practical or safe to have multiple CPUs in the vicinity of the workstation. USB/KEYBOARD: Hot keys enable the user to switch and control all the different functions of the KVM switch. RS-232: Any external device or program supporting RS-232 can control the D2H-4P. The D2H-4P uses a very simple protocol that enables easy integration with other devices. INDEPENDENT SIMULTANEOUS DEVICE SELECTION: Flexibility is key with the D2H-4P. It enables the use of a USB keyboard and mouse of one computer while other USB peripherals such as scanners and printers are connected to other computer sources. D2H-4P maintains the ability to switch all connected devices to any one of the computer sources as with any other KVM switches. Question: Does this support 10-bit color at 2560x1440 @ 60Hz? I have confirmed with the manufacturer that the D2H-4P does indeed support 10-bit color at 2560x1440 resolution (@60Hz). Question: Am confused by the pictures/specifications for this switch. Some of the pictures show the video output as DisplayPort, others as HDMI -- could you please clarify? The SmartAVI D2H-4P is actually designed as such; It's a 4 Port Dual Monitor DisplayPort (input) KVM Switch that outputs 2x HDMI signal. This is designed for applications where the source computers are DisplayPort, but the output needs to be HDMI (i.e. where the source computers are MACs, but your monitor is HDMI). If you would prefer a pure 4 Port Dual Monitor DisplayPort KVM Switch (DisplayPort in/out), you may want to consider the SmartAVI DPN-4PDUO. If you would prefer a pure 4 Port Dual Monitor HDMI KVM Switch (HDMI in/out), you may want to consider the SmartAVI DPN-4PDUO. Question: What is the version of HDMI port? Does this thing support 4K 60Hz RGB(YCbCr 4:4:4) 10-bit output? The SmartAVI D2H-4P features HDMI version 1.4. It would not however support that resolution combination. For KVM Switch that supports 4K 60Hz RGB (YCbCr 4:4:4) 10-bit, you may want to consider the Aten CS1924 as an alternative. Question: If this thing supports EDID emulation, does that mean the monitor on HDMI port doesn't flicker at all when switching, with zero latency? workspaces and screen resolutions are remembered even when disconnected from monitors. That being said, it it's still typical with DisplayPort based KVM switches, such as this D2H-4P, to have a switching time of 1-5 seconds. if you are looking for faster switching speed, KVM switches based on video standards, such as HDMI-based KVM Switches, are typically faster at switching.